After changing rooms at Banana Azul the previous afternoon, on Day 5 of our trip, we spent our first glorious morning in the Howler Suite. 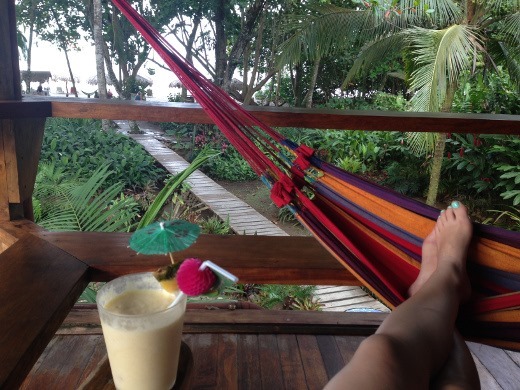 At about 6:00 AM, I first skipped down a flight of stairs in my PJs to the empty restaurant below, and filled up a big mug with Banana Azul’s crazy strong ‘crack’ coffee, and brought it back to our private balcony for maximum enjoyment. Helll-lo! 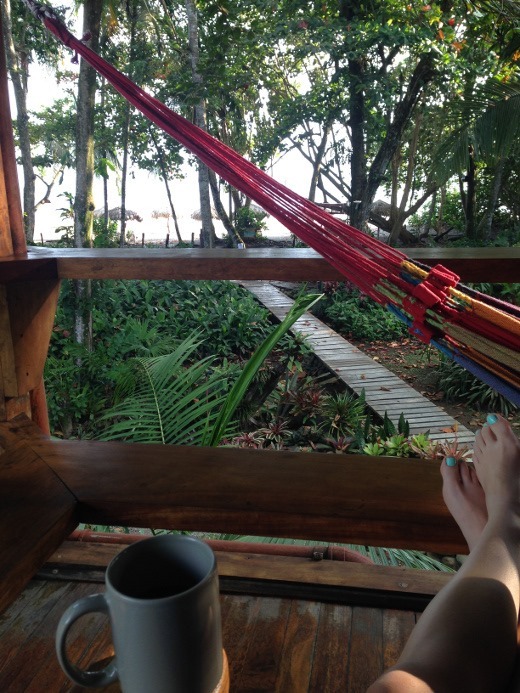 My life would be so much better if I could spend every morning drinking strong black coffee while listening to birds chip, monkeys howl, and waves crash, smelling fresh ocean air, and being surrounded by Costa Rican jungle. 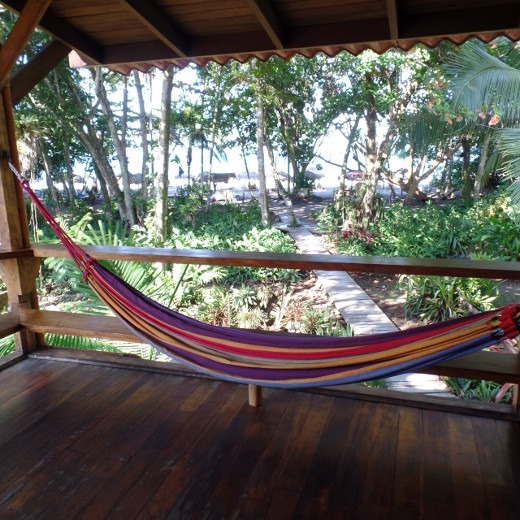 Maybe we’ll retire in Costa Rica one day. I love it there. After being properly caffeinated, the huz and I headed downstairs for breakfast (included in our stay). 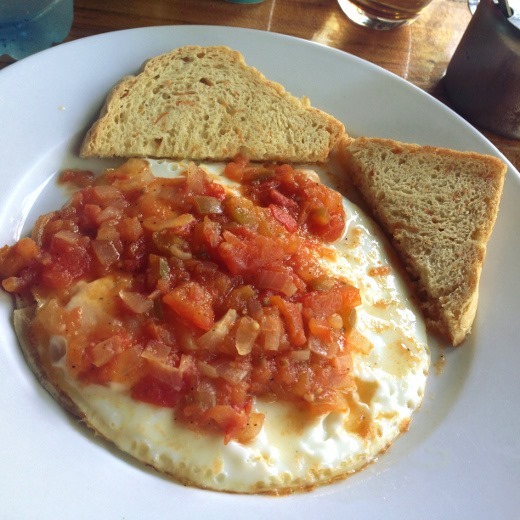 I so enjoyed the fresh, hot breakfasts we ate each morning at Banana Azul, accompanied by cereals, fruit, juices, and yes, more coffee. On the ride from our hotel to the sanctuary, our cab was stopped at a checkpoint and we were required to show our passports (well, copies; we typically keep the originals in the hotel safe, and keep paper copies hidden in money belts under our clothing when we travel internationally). Our cab driver told us that there are few major thoroughfares in Costa Rica, and the road we were on is one of the major routes that smugglers use when transporting illegal goods from Panama to Nicaragua. So that was different. 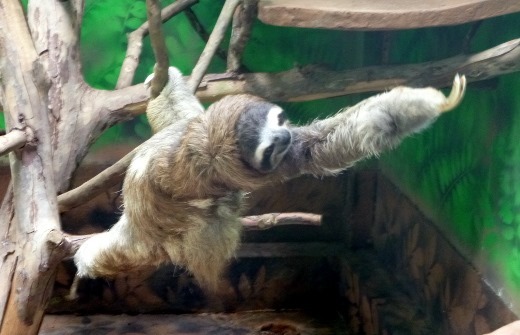 But anyways, about 30 minutes later we made it to the Sloth Sanctuary in one piece! We elected to participate in the Insider’s Tour, a step up from the standard Buttercup Tour. 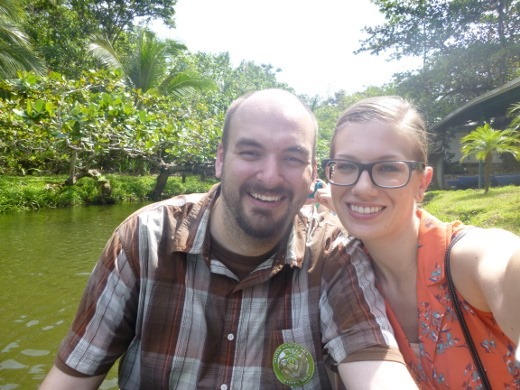 This tour was more expensive than the standard tour but we figured that if we had flown thousands of miles to get to Costa Rica, we might as well do it up right. Also, YOLO. The extra fee was definitely worth it, as I know the proceeds go towards maintaining the sanctuary. I should also note that we booked our tour reservation far in advance. 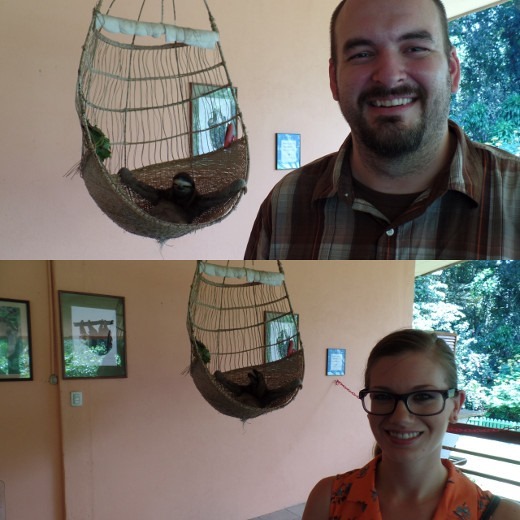 First up, along with two other couples participating in the standard tour, we got to meet a few of the adult permanent resident sloths at the sanctuary. 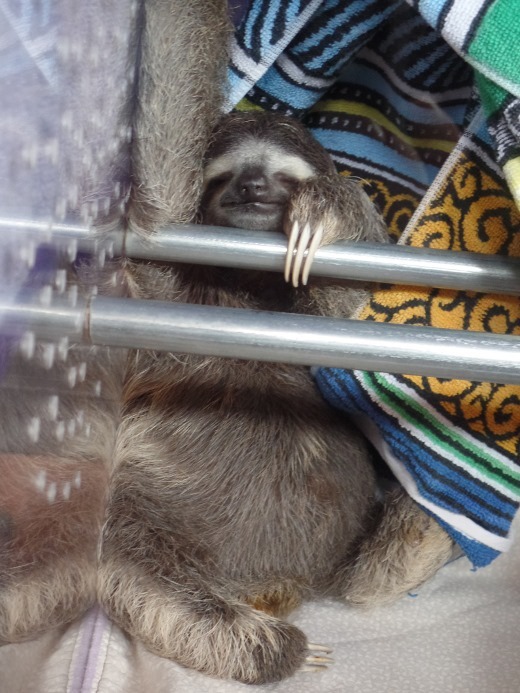 Here is our favorite sloth that we met of the day, Toyota! Toyota, the poor dear, has but one arm (and two legs), having lost a limb in a terrible accident before being recued and brought to the sanctuary. 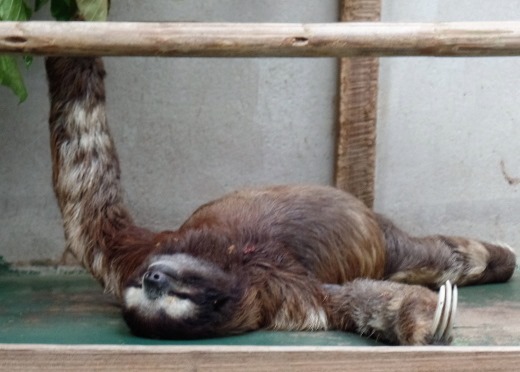 Due to this loss of limb, Toyota isn’t able to be released back into the wild (as many injured adult sloths who rehabilitate at the sanctuary are), and instead lives a happy sheltered life at the sanctuary. As our guide shared Toyota’s story with us, Toyota slowly and gingerly made his way over to the edge of his habitat and reached out his arm to our guide, begging for a hug. Literally the most precious thing I’ve ever seen. 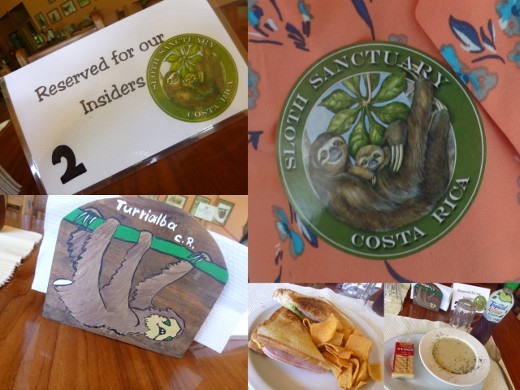 We met several other adult sloths during the first hour of our tour, and our guide shared each of their stories with us. Next, we had lunch with Buttercup! The huz and I were the only two “Insiders” of the afternoon, and had a nice table for two seated right in front of Buttercup, the oldest (and most photogenic!) 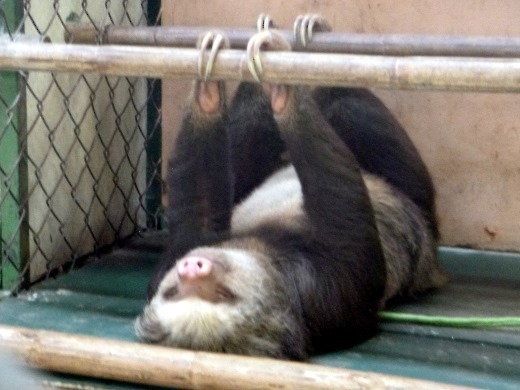 sloth at the sanctuary, who is responsible for inspiring the establishment which has been caring for sloths since 1992. Buttercup is a 23 year-old three-fingered sloth that was first brought to the family that operates the sanctuary back in 1992, as an orphan would couldn’t otherwise survive on her own. After being denied assistance by the local zoo, the family took it upon themselves to care for Buttercup. After that, the family became known for their experience in caring for injured and orphaned sloths, and eventually, the sanctuary was born! Buttercup awoke up from her nap in time to join us for lunch and very, verrrry slowly, start thinking about nibbling on her own lunch. We spent about an hour eating lunch and observing Buttercup which was pretty fascinating. Omg that face! Have you ever!? So smug! 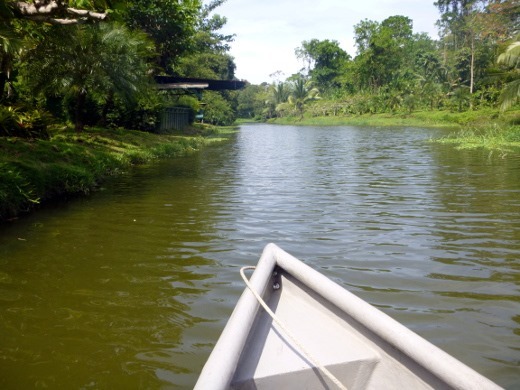 After lunch we enjoyed a leisurely canoe ride down the river that fronts the property. 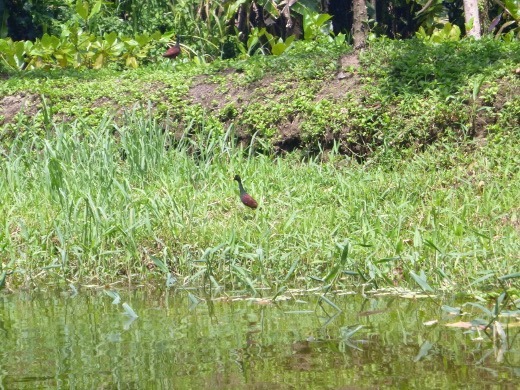 Our boatman/guide pointed out lots of wildlife along the way. Can you spot the bird? 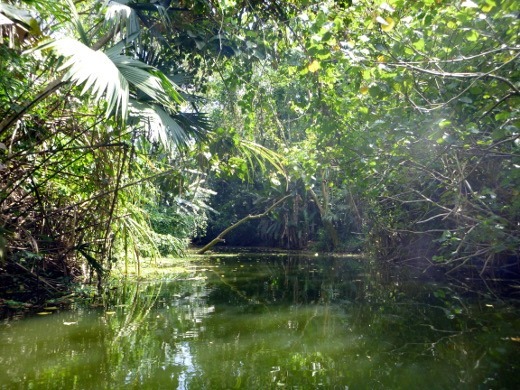 And the caiman in the water below? 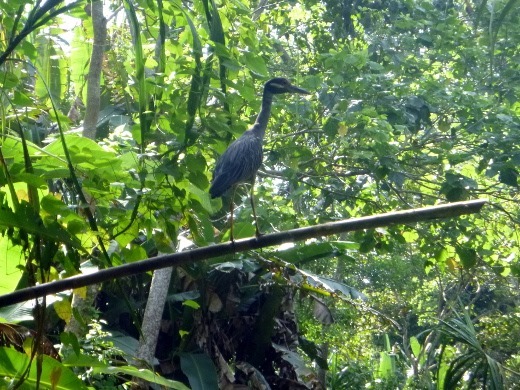 We saw all sorts of exotic birds, blue crabs, bats, lizards, banana trees, a wild sloth head (they look like coconuts), and so much more. 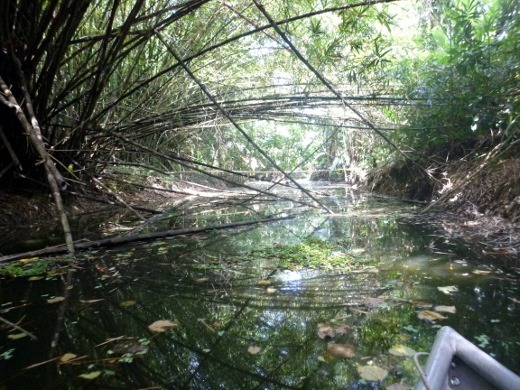 We also boated through some dense vegetation on the river! Shhh! Don’t scare the bird! 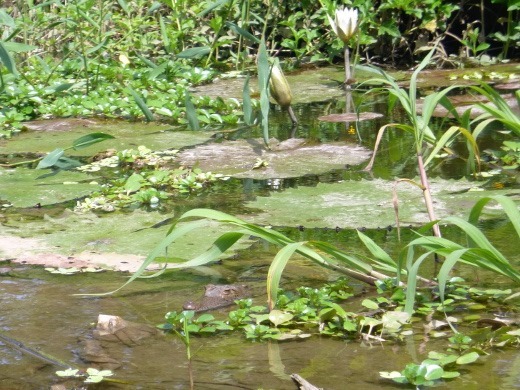 We quietly crept up on lots of wildlife during the ride. 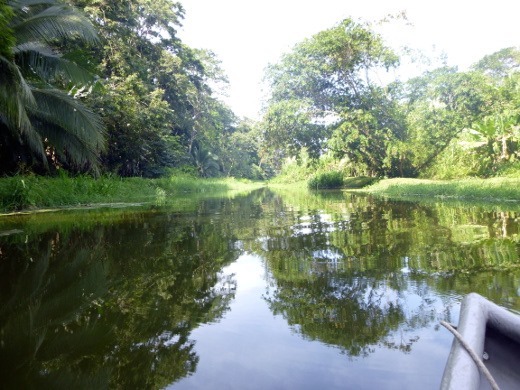 Our serene canoe ride was lots of fun. The last half of our Insider’s Tour was the best part! Here, the huz and I toured the facility with our own personal guide – the founder’s grandson, Jeffrey, who was very friendly and knowledgeable. First he showed us one of the areas of the sanctuary that is kept away from the public eye for a reason. 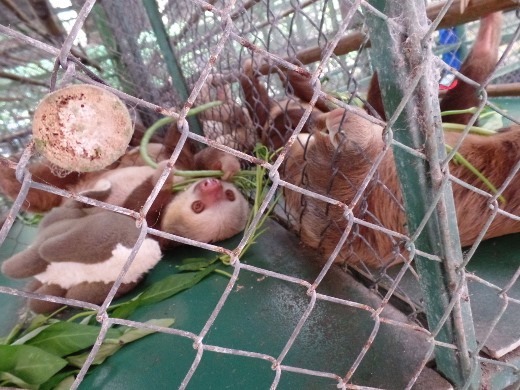 These are sloths that are being rehabilitated and it is hoped that most or all will be released back into the wild after they recover from their injuries. 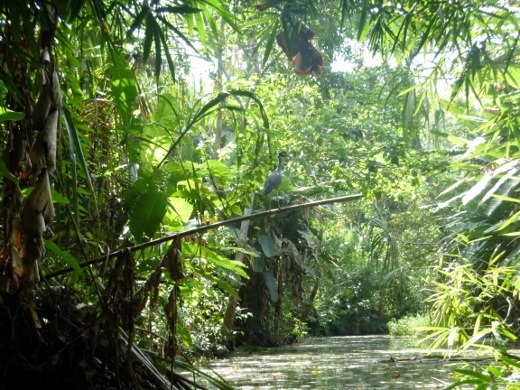 For this reason, the sanctuary keeps the amount of human exposure these animals experience to a minimum, so they do not have problems when reintroduced to the wild. As “insiders” we had the amazing opportunity to have a peek behind the scenes a these incredible (read: adorable) sloths. 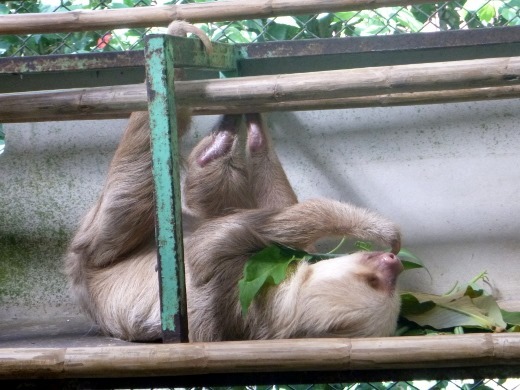 The sanctuary cares for both two-fingered (above) and three-fingered (below) sloths. Look at that big ol’ belly! This mischievous gal was very active and very hilarious! We fed her hibiscus flower petals which are like chocolate to sloths. This is me by about 9:00 PM every night since I got pregnant. I kid. Okay, actually I’m serious. 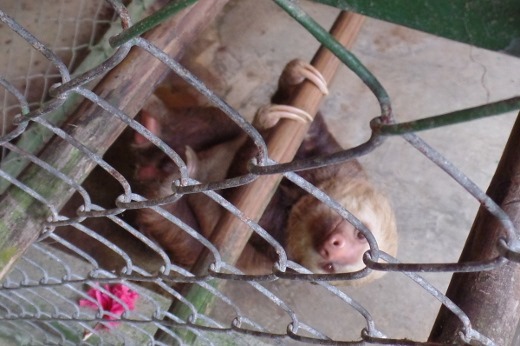 We also got to visit the Sloth Nursery, which houses baby sloths that have graduated from the Sloth NICU. Yes, that’s a thing. More on that soon. This baby sloth was a surprise! 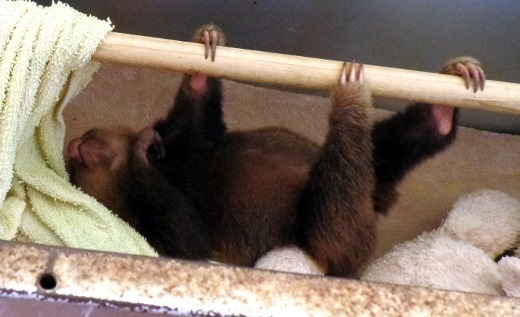 Apparently a male and female sloth mated through their enclosures and boom, a few months later, baby was born! He is fiercely protective of his stuffed animal BFF. 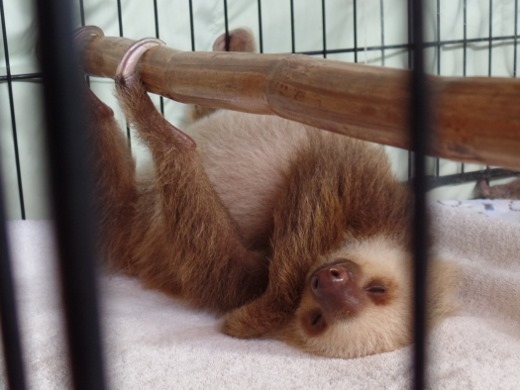 Can you ever tire of looking at sloths? I hope not because I have lots of pictures left. 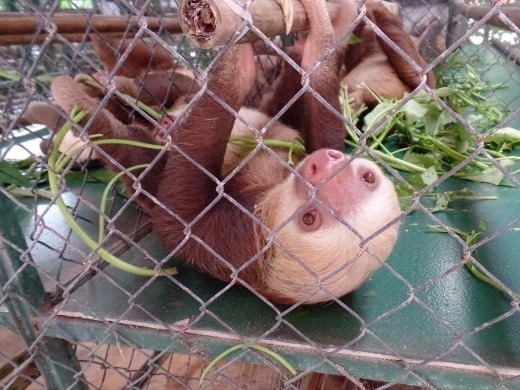 Our next stop was a brief tour of the Sloth Hospital where medical procedures like x-rays or surgical procedures are performed on injured or ill sloths. 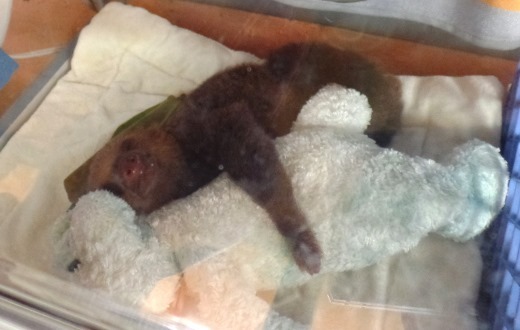 After that, it was time for a visit to the Sloth NICU. See, I told you it’s a thing. 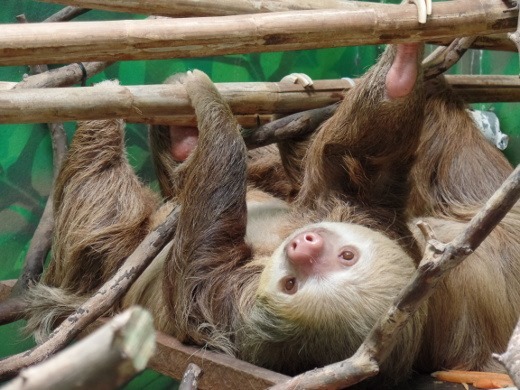 And it houses dozens of ADORABLE INFANT SLOTHS. These poor little orphans are lovingly cared for in the NICU. The are hand-fed and given warm incubator beds and cozy stuffed animals to nuzzle up with in place of mom. They become quite attached to their stuffed friends and aren’t happy if you try to separate them. During our visit, there was only one infant three-fingered sloth in the NICU (below); all of the others were two-fingered sloths (above). 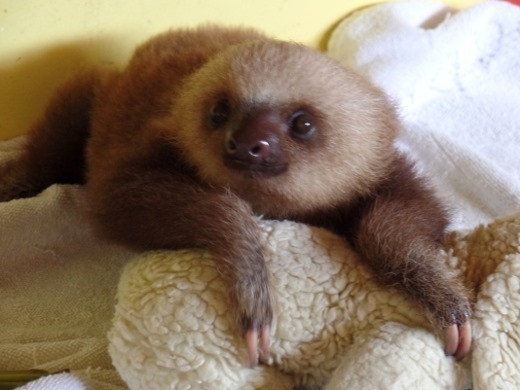 I can’t even right now with this adorable baby sloth face. 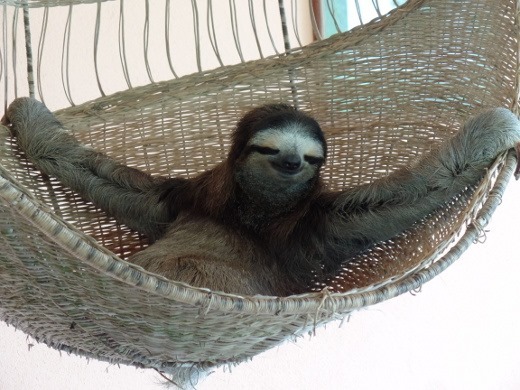 And that, my friends, brings us to the end of our Insider’s Tour at the Sloth Sanctuary. Before leaving, we said our goodbyes to Buttercup. 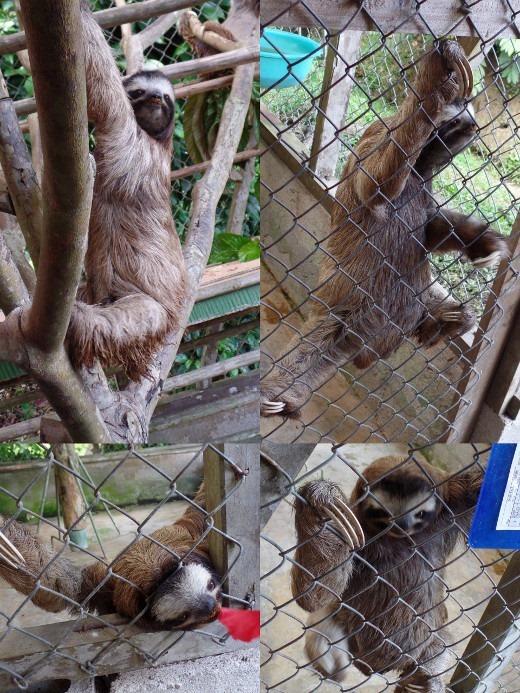 Visiting the Sloth Sanctuary was truly a once-in-a-lifetime opportunity and I’m so grateful that we had the chance to experience it! 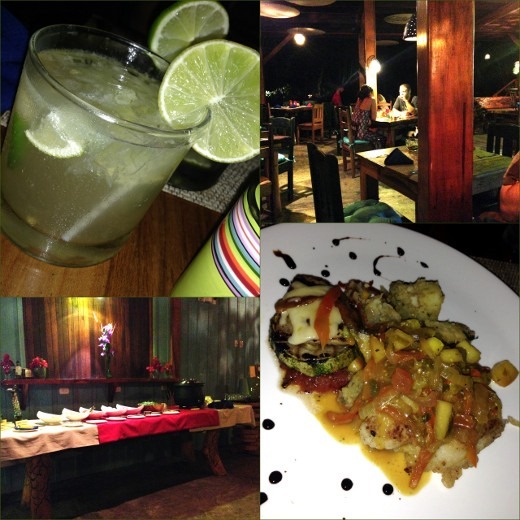 If you are ever in Costa Rica, you must pay the sanctuary a visit. After our day at the sanctuary, we cabbed it back to our hotel and spent the rest of the afternoon and evening relaxing on our balcony. You know what would make that scene even better? A piña colada, that’s what. I read hundreds of pages of A Dance With Dragons during our trip and it was glorious. For dinner we had guaro sours and a seafood dish that I am blanking on, accompanied by homemade soup and salad bar at the hotel restaurant. 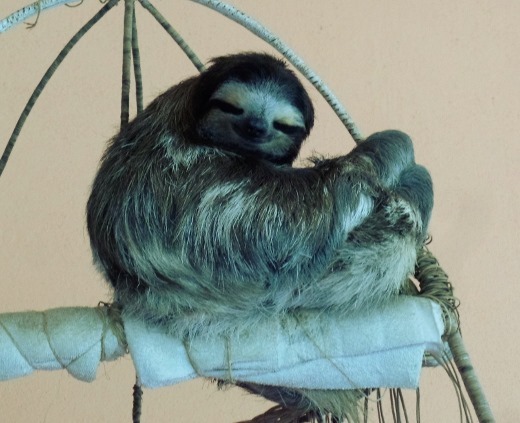 Do you recall roughly how much the cab ride was from your hotel to the sloth sanctuary each way? Did the hotel arrange the cab for all certain time? Thanks for posting! 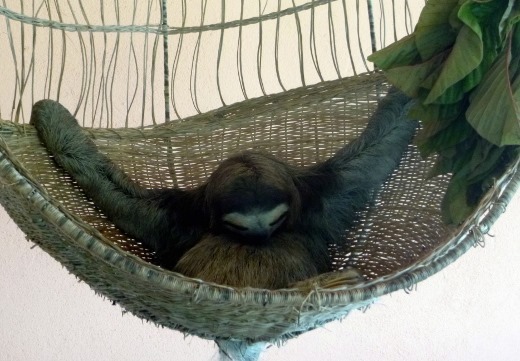 The taxi to the Sloth Sanctuary was $32 each way, and the hotel front desk arranged for it. Thank you so much for the info! 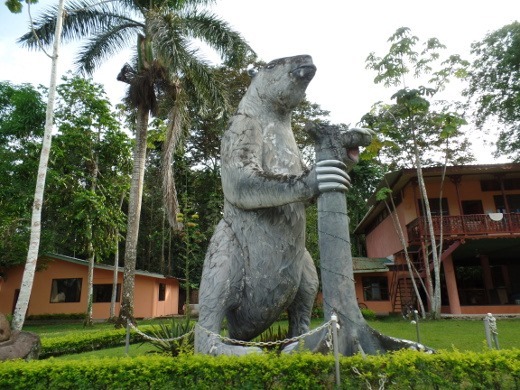 I’m trying to plan next year’s trip to Costs Rica. 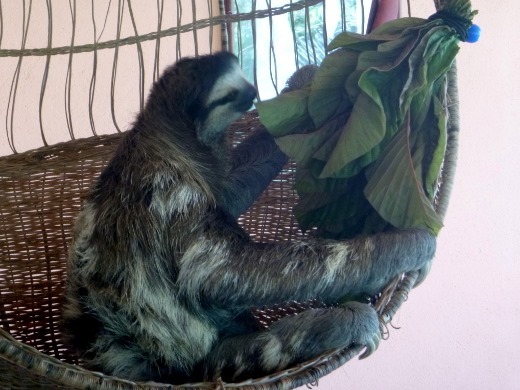 The Sloth Sanctuary is a must for us, so I’m trying to plan a few days on the Caribbean coast, and looking at the Banana Azul as well.